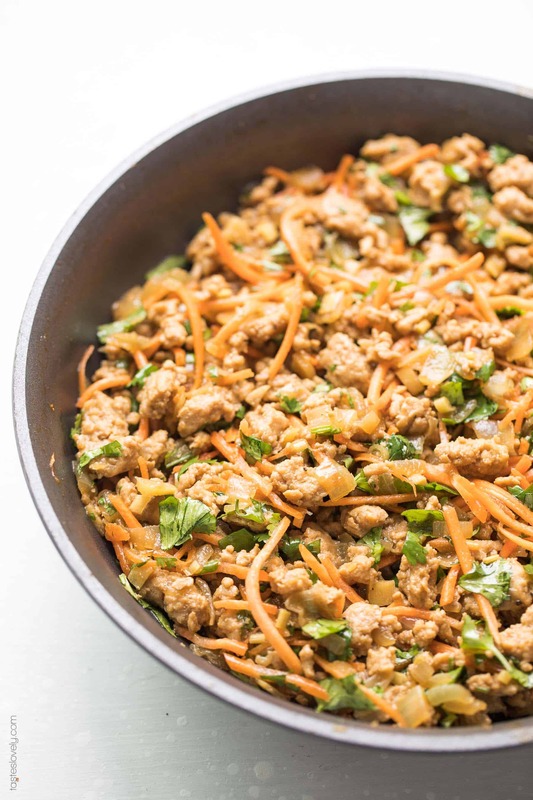 Paleo + Whole30 Thai Chicken Lettuce Wraps – a quick and healthy dinner recipe with ground chicken, sauteed onions, a thai sauce, cilantro and shredded carrots. Topped with a bright and fresh herby green dressing and cashews. 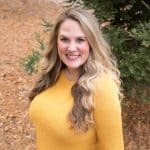 Keto, gluten free, grain free, dairy free, sugar free, soy free, clean eating, real food. 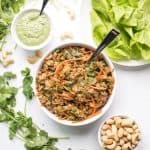 I have such a food crush on these paleo + whole30 thai chicken lettuce wraps. The flavors are amazing! And it comes together so quickly. 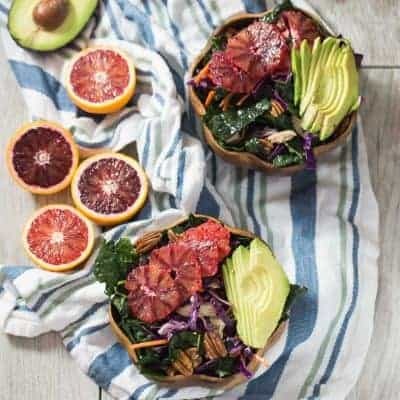 These days, with a 2.5 year old and newborn, I’ll take all the healthy 30 minute dinner recipes I can get my hands on. So apparently July is becoming my unofficial “I-love-everything-thai-recipes” month. First I shared my paleo + whole30 thai almond butter coleslaw, then I shared my paleo + whole30 thai chicken satay skewers. 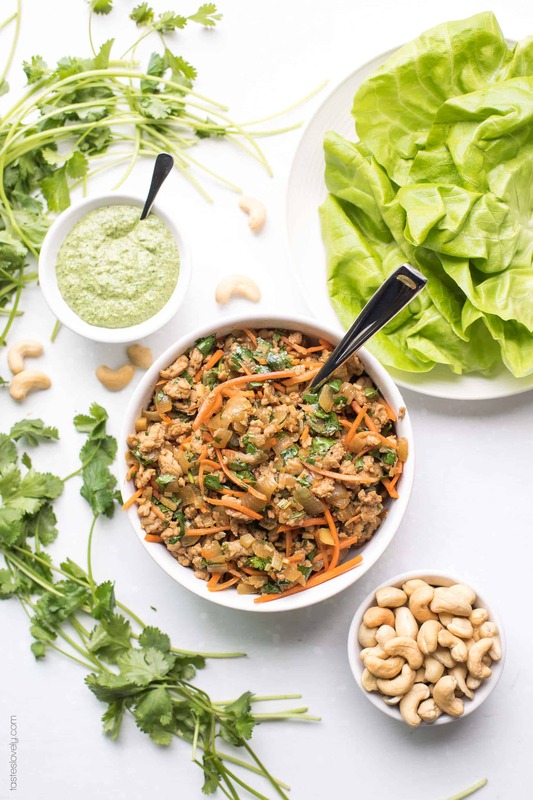 And now, these super flavorful and delicious paleo + whole30 thai chicken lettuce wraps. 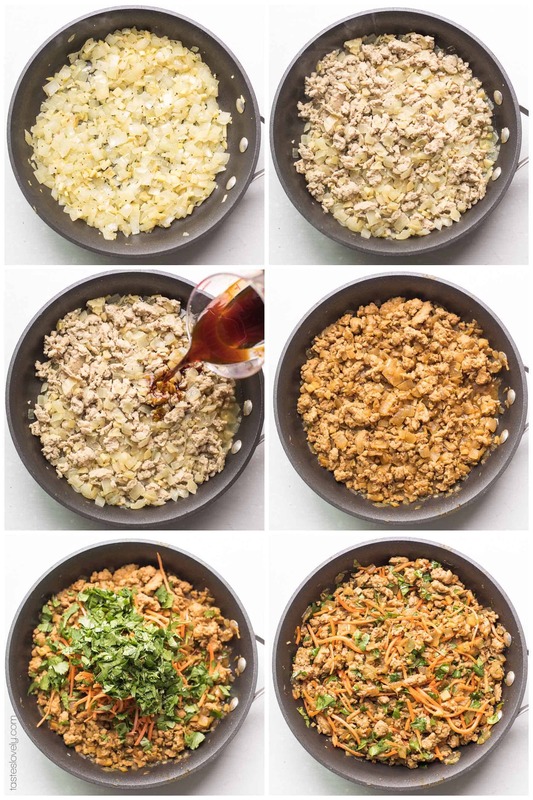 The thai chicken filling comes together in a snap. You sauté some onions, ginger, lemongrass and garlic until they’re softened, then add in the ground chicken (you could also sub ground turkey!). Flavor it up with the paleo + whole30 thai sauce (just 4 ingredients! ), cook until the sauce is reduced, remove from the heat and add in the carrots, cilantro and serve on butter lettuce. The filling is delicious warm, and it’s equally delicious cold. So any leftovers make the best lunch the next day cold out of the refrigerator. 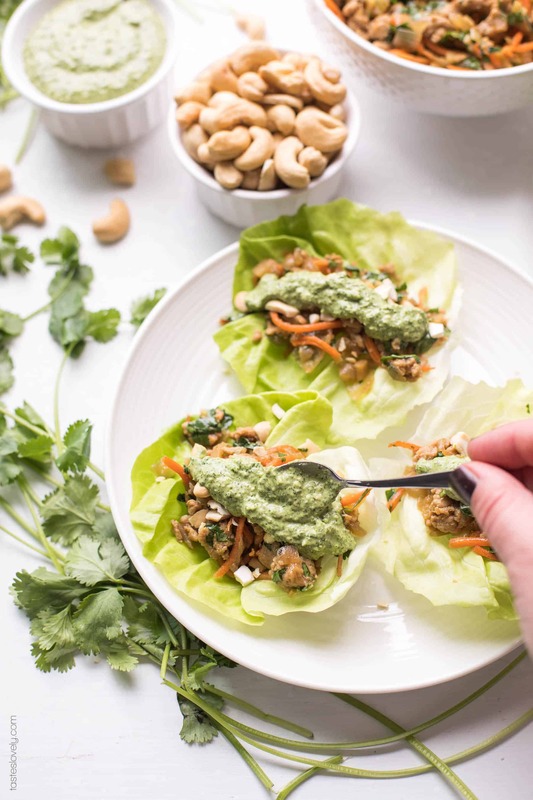 You could eat the filling as is, but I especially love it topped with cashews and my paleo + whole30 herby green dressing. 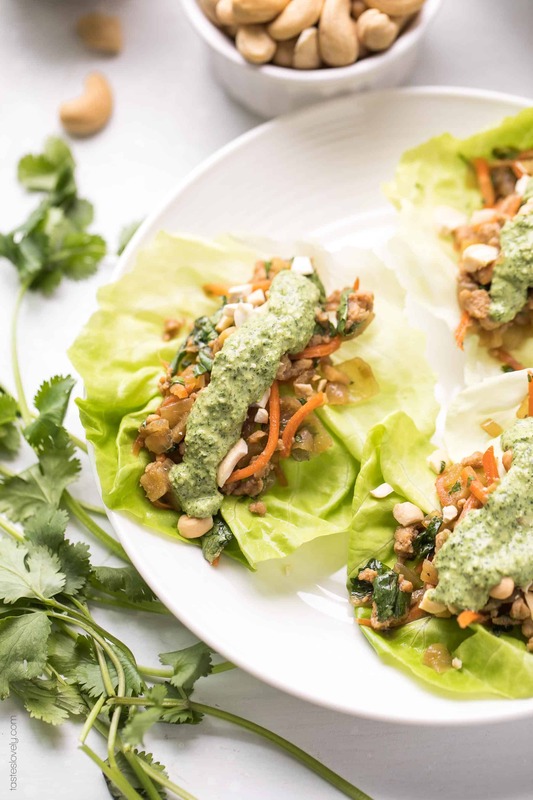 The mint in that dressing adds the perfect amount of brightness to these paleo + whole30 thai chicken lettuce wraps. 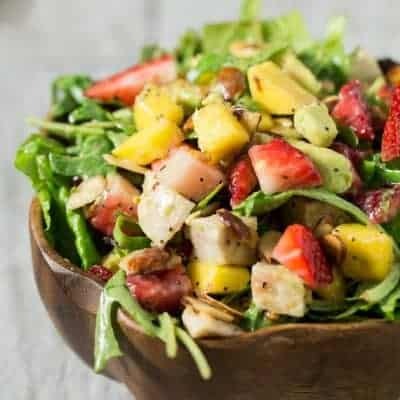 So tasty, and so healthy! 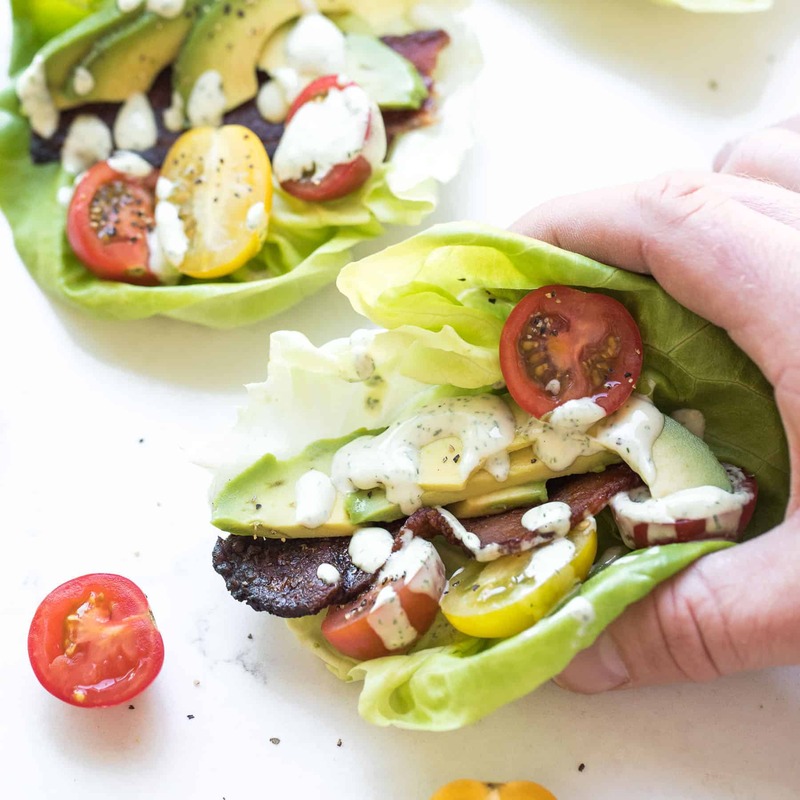 These lettuce wraps are paleo, whole30, keto, low carb, gluten free, grain free, dairy free, sugar free, soy free, clean eating, real food. 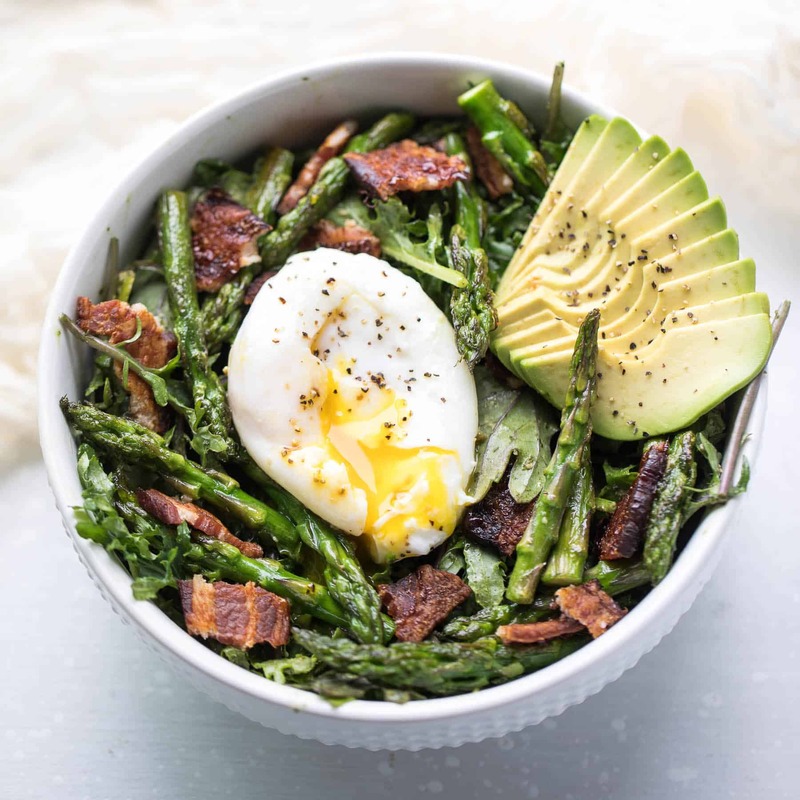 A dinner the whole family is going to love! In a small bowl, make the sauce by combining the coconut aminos, fish sauce, rice wine vinegar and sesame seed oil. Stir to combine. Set aside. Heat a large skillet over medium heat. Add the olive oil and cook the onions, ginger and lemon grass until softened and translucent, stirring occasionally, about 10 minutes. Add the ground chicken, and cook until no longer pink and cooked through, stirring occasionally, about 5-8 minutes. Add the Thai Sauce to the chicken mixture, turn the heat up to high, and cook until the sauce is almost completely absorbed, about 5 minutes. Remove from heat and allow to cool for 2-3 minutes (mixture will be very hot). Add the shredded carrots and chopped cilantro, stir to combine. Serve warm scooped onto butter lettuce and topped with roasted cashews and my herby green dressing. Am cooking this tonight for my brother and for myself and for leftovers of course. I calculate all of my calories at myfitnesspal.com!